ND Jig & Gauge Co Ltd is a steel washer manufacturer. View our full range of products and services. 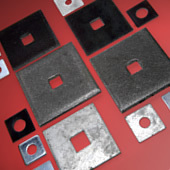 Square Plate WashersN D Jig & Gauge stock a vast range of square plate washers. As a leading manufacturer, the company has the capability to create special square plate washers to fast turnaround times to suit your needs. Sizes from 25mm x 3mm thick up to 150mm x 25mm thick in stock. Please contact our sales office for details of the full stock range. Manufactured product is readily available from stock, meaning supply-on-demand and fast turnaround times. As a manufacturer, ND Jig & Gauge has the capability to create bespoke items to your specific dimensions and working drawings. 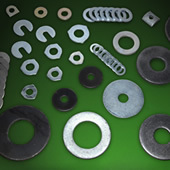 The company also manufactures and supplies special nuts, oblong plates, tab washers, blanks and various pressings. ND Jig & Gauge Co. Ltd.